Deborah Hale is an award-winning Canadian writer of over 15 romance and fantasy novels. An avid genealogist, Hale spent ten years tracing her family tree to its roots in 18th century Britain. In the process, she uncovered several true romantic stories that inspired her to begin writing her first romance novel. Deborah's books have been translated into more than a dozen languages with over a million copies sold worldwide. Nancy Holder teaches creative writing and has achieved fame as the author of novels set in the Buffy the Vampire Slayer, Angel, and Smallville universes. In addition to winning the Bram Stoker Award from the Horror Writers Association (four times! ), she has been honored by Romantic Times Magazine for her work. 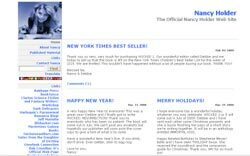 Nancy Holder published seven romance novels. She has also written for Silhouette Bombshell and Silhouette Nocturne. She also publishes under the name Laurel Chandler. Have A Favorite Romance Author H? Do you have a favorite Romance Author whose last name begins with "H"? Share it! "H" Romance Authors" Tell us about yourself and your latest Romance Novels!